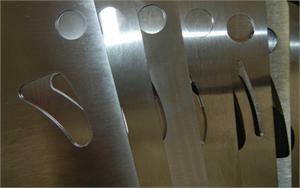 CNC-laser cut stainless steel porting template for 12A/13B 1st. generation cars, built from 1974-1985. Unlike other templates, the holes are already cut for you. Just spray or brush Dychem or similar Layout Fluid on the porting surface, then scribe the port outline using the template onto the layout fluid stain. Please note the templates are SOLD SEPARATELY. The "RACE" template is a 4 port design. In the '80's, it might have been called a Rally port. Similar ports were used in off-road rally.